Last year I hit a pothole so hard on my 15 year old Trek 1000 that I put a dent in the back wheel. Rather than just replace the wheel (gears have changed in 15 years, hard to find compatible old stuff), I ended up buying a whole new bike. It's lovely. I like it a lot. But. I sometimes have to leave a bike somewhere that I'm not 100% sure of - like the station - for longish periods of time - like a working day, or overnight. And both of my bikes were now a bit good for me to be comfortable with that. 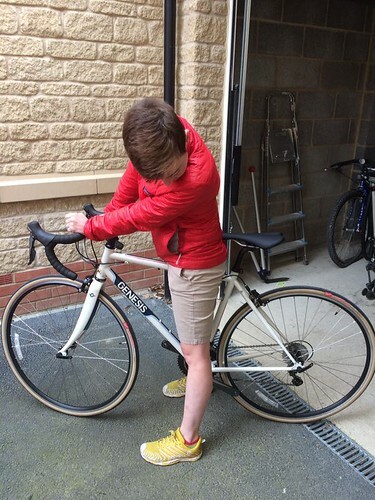 So, I've rebuilt my Trek in a new configuration. Yep, I finally did a singlespeed conversion. Those wheels and tyres were £70 for both, so the quality isn't great. But I love the red! And they are not quick-release. So this bike has a lot of the original components off the Trek, with the saddle that came with the new bike, some really cheap platform pedals with loose bearings, and hacked off handlebars. 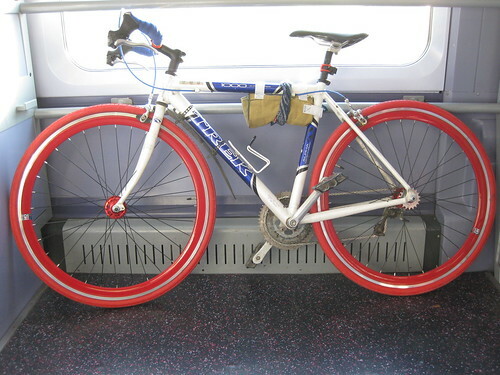 It is perfect for leaving at the station, and the red wheels make it really easy to find when I get back to it. But! I still need to lock it. 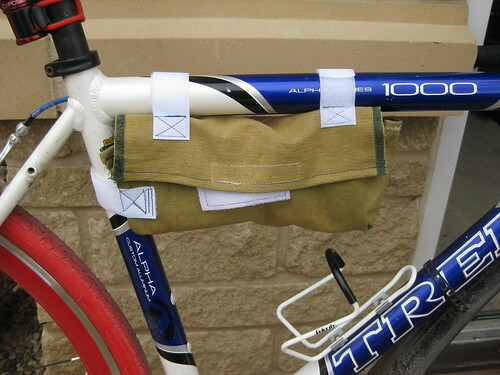 Which means carrying my heavy abus chain lock. I tried wrapping it round parts of the bike, but the rattling was immense, plus I could never get it tight enough. It's filthy, so I'm not putting it round me anymore (and it's too big for my hips anyway). 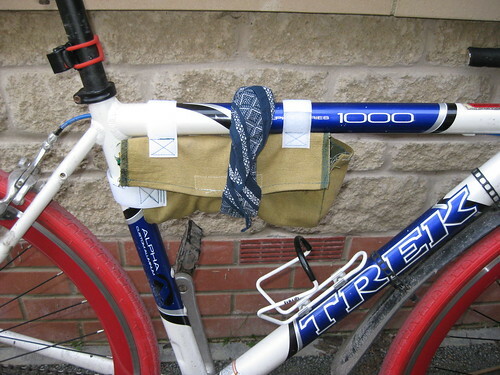 I have a Carridice saddlebag that I use for it on my other bags, but those aren't cheap and the purpose of this bike was to be left in dubious situations. I had a really quick look for something cheap that could work, and drew a blank. I knocked this up from some old pieces of canvas from an army bag I used to carry my cricket kit in and a load of velcro. Sits nicely out of the way, doesn't rattle, takes the lock, and it's ugly enough that I doubt it'll be nicked, and if it is I'd just be irritated. 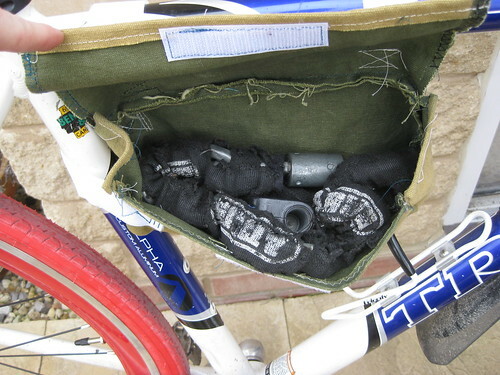 Unfortunately, the roads of Oxfordshire are full of potholes and other nastiness, and it turns out that the velcro isn't quite strong enough to hold the bag shut when you hit a lot of bumps. It developed an alarming tendency to eject the lock at really inconvenient moments. Further work required, but for now? The bandana is doing the trick. Your comment will not appear until it has been cleared.